I tried to dig my way through a planet this morning at PAX East, but didn't quite make it, spinning and panicking in darkness somewhere within the crust. Apparently the center of the world isn't the best place to try to reach, anyway. I'm just glad to know I could've made it. 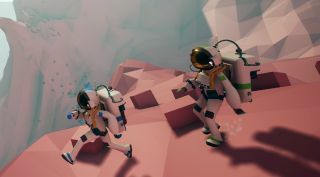 Astroneer is an open-ended, cooperative space survival game that puts you, a little astronaut, on a variety of spherical stellar objects where you can mine, build bases, and morph the terrain, growing mountains or digging deep trenches. Right now, the controls are a tad wonky—the camera requires some manual fiddling and I got stuck on alien rocks here and there—but there's clearly some interesting machinery to toy with and things to build. And of course, you can dig, and dig, and dig. Astroneer is currently planned to release in Early Access this year. Watch my interview above to find out whether or not you can build a ladder to the moon.